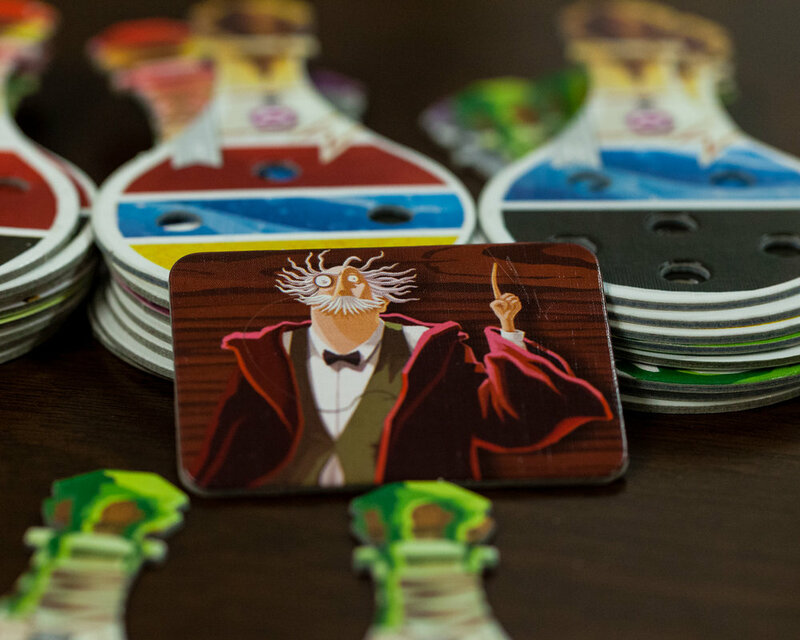 In Potion Explosion, players are students at the Horribilorum Sorcery Academy for Witty Witches and Wizards, today being the final exam. Who will be the most skilled at potion brewing? Put all the ingredient marbles in the dispenser. Make sure the marbles completely fill all 5 tracks. Place the Little Help Tokens and the Skill Tokens near the dispenser. The number skill tokens used will depend on the number players. 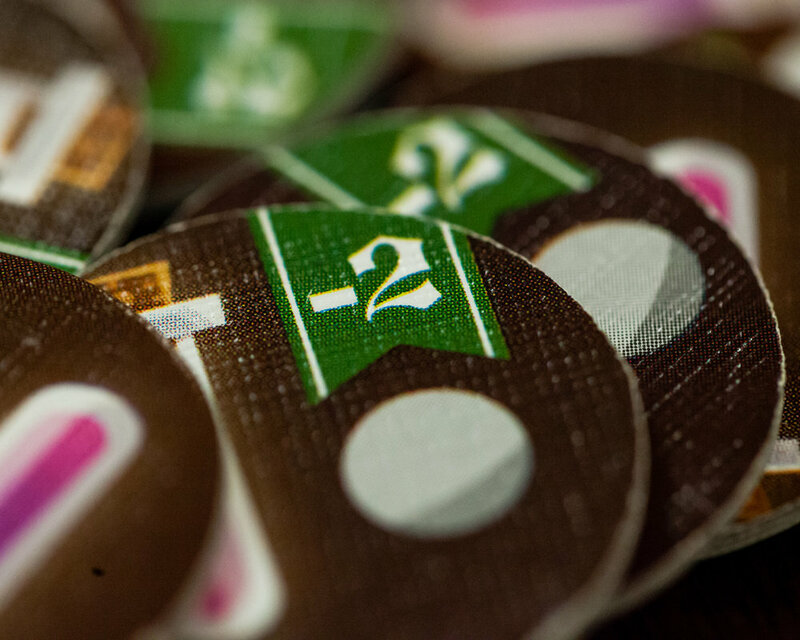 The player who most recently prepared a drink receives the first player token. Each player receives a desk board and places it in front of them. Take all the potion tiles and remove 2 of the 8 different kinds of potions and put them back in the box. From the 6 remaining types of potions, take 2 starter potion tiles per player and lay them out in the middle of the table. Starting from the first player and proceeding clockwise, each player drafts one of the starter potion tiles. Then starting with the last player and proceeding counter-clockwise, each player drafts one of the remaining potion tiles. These are placed recipe side up (The side with the gray ribbon) in the brewing area of their desk board. The game is played in turns in clockwise order. A player may do each of the following actions on their turn. A player must choose and take 1 ingredient marble from the dispenser. When a marble is removed from the dispenser, marbles will roll down to fill the gap. If two marbles of the same color collide, they explode. The player who caused the explosion takes all of the connected marbles in that explosion. If there is another explosion, the player takes those marbles as well. A player may drink 1 or more of their completed potions. When you drink a potion, turn it upside down to indicate it has been used and use it's magical ability (There is a chart for this). A player may ask for a Little Help from the Professor before or after their regular pick of the turn. Take the Little Help token (-2 points at the end of the game) and 1 ingredient of your choice from the dispenser. Keep in mind that asking for a Little Help or using a potion will not cause an explosion even if two marbles of the same color collide. You must place any ingredients (marbles) on any empty holes of your potion that share the same color. That ingredient cannot be moved until the potion is complete. If you have any left-over marbles, you can store up to 3 of them in the flask on your desk. All remaining marbles will be returned to the dispenser at the end of the turn. If you still have marbles in your hand, return them to the dispenser. If you have less than 2 potions in your brewing area, you must select a new potion. You may not place any ingredients on the new potion until your next turn. Check to see if you have earned a skill token. Skill tokens are earned by completing potions; either 3 of a kind or 5 different potions. If there are no more skill tokens or no more potions available the game ends. Play continues until the player to the right of the start player completes their final turn. Skill tokens from the general pool can still be earned. Negative points for Little Help tokens. Setup is pretty easy. The good thing about the dispenser is that once it's set up the first time, it stores neatly in the box which is an unexpected bonus. When filling the dispenser at the start of the game you end up with some left over marbles. The first time we played we didn't really know what to do with these but in subsequent games we decided to just leave them on top of the dispenser as they will roll down during the first turn of the game when a player starts removing marbles from the track. I like that there are 8 potion abilities but that 2 of these abilities are removed for each game. This increases the replayability. I recommend doing this at random rather than choosing which 2 to remove but the rule book does leave that up to you. The components of the game are pretty good quality. The only thing I noticed is that the cardboard dispenser gets pretty beat up but I want to take in to consideration that the copy I've been using is from a busy board game cafe. If you're not disassembling the dispenser each game this shouldn't become an issue. All the other components are colorful with fun art that matches the theme of the game. I absolutely love the mechanic used to trigger an explosion. Taking a Little Help or using completed potions to make small adjustments prior to selecting your marble adds more depth to the game than just selecting a marble each turn and can help you to trigger multiple explosions in a row. This is also balanced by only allowing a player to complete 2 potions per turn so they don't get too far ahead if they manage to collect an insane amount of marbles in one turn. It's a simple game but I do love it. I've been playing it a lot when we've been in the mood for something simple or something easy to teach. I consider it a filler game more so than one I would grab right off the bat with my gaming group. That being said, for a family game night scenario it would probably be one of my first choices.